For our address, location map and contact details please see the ‘Contact Information’ section at the end of this document, or the ‘Contact Us’ button on our website. You can plan your journey by car or public transport using www.transportdirect.info simply enter your postcode and ours, which is SY11 2EY, for full directions. The nearest railway stations are at Gobowen (3 miles), Chirk (7 miles) and Shrewsbury (18 miles). Local taxi services are available, We are happy to help you with advance bookings. The nearest bus stop is approximately ¼ of a mile away. 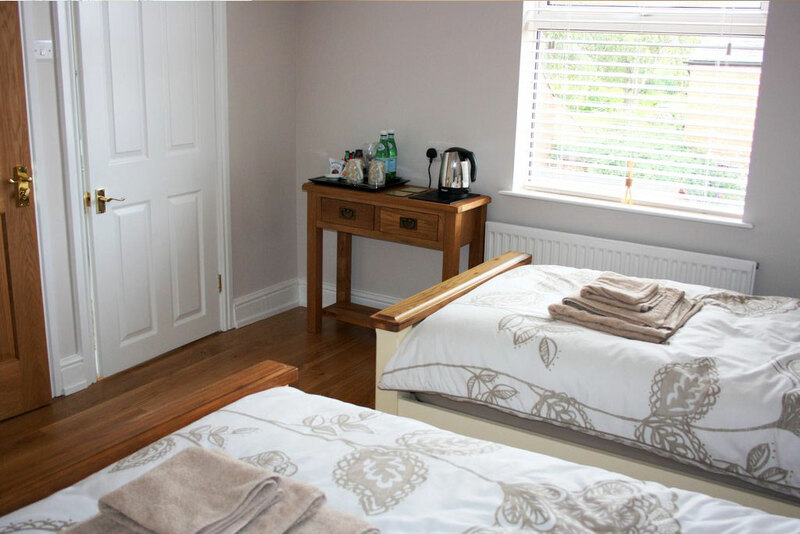 We currently offer 2 guest bedrooms with en-suite bathrooms. There are no ground floor bedrooms. There are 16 evenly spaced stairs ascending a staircase to reach the landing and entrance to all letting rooms. Each step is approximately 19cm high, 24cm deep and 78cm wide. There are banisters to the left of the staircase as you ascend. The stairs have a short pile, fitted carpet. · Heating is thermostatically controlled and adjustable. Please advise us of your anticipated arrival time so that we can be sure we are here and ready to welcome you. To ensure that your accommodation is ready, we ask that guests do not arrive before 4.00pm. However, earlier arrival may be possible by prior arrangement. There is on street parking available outside the B&B and a public car park approximately 400 yards towards the town centre. We will be happy to assist you with your luggage and with parking. The bedroom and landings have ceiling lighting, controllable from the door, at the top of the staircase and in the lobby. The bathroom has overhead lighting controlled from the door and lighting inset into the mirror above the wash basin. There are bedside lamps on each side of the bed. The duvets and pillows have a high quality synthetic filling, suitable for guests with allergies. The bedroom is lockable with a key and guests are provided with a front door key on request. Guests can come and go as they please, with consideration to other guests, should they arrive back late. There are smoke alarms in each room and Laurels has a fully integrated fire alarm system. We will alert all guests if we hear an alarm sounding and guide them out of the building. We incorporate a simple to follow instruction in the rooms in case of fire. The en-suite bathrooms are of a comfortable size and one has a raised toilet and shower area. There is a guest information folder in each bedroom which provides information on our services, local services and emergency information. Breakfast is served in the dining room which is located on the ground floor. The floor is varnished wood. There is thermostatically controlled central heating · Gentle background music is played on the hi-fi system – but we can turn this off if required. We are able to cater for varying dietary requirements. We stock decaffeinated coffee and tea and some fruit or herbal infusions and we are happy to supply soya milk, or other alternatives on request. Please advise us of your requirements when booking. Bedrooms, corridors, landings, the main staircase and the hall which comprise the escape route in the event of a fire are fitted with an emergency lighting system. If you require assistance to alert you in the event of a fire or help with evacuation in an emergency – please let us know at the time of booking and we will be happy to help and make the necessary arrangements to ensure your safety. Shopmobility services operate in Oswestry (Tel: 01691 656882) and Shrewsbury (Tel: 01743 236900). The nearest General Hospitals with A&E unit are in Shrewsbury (17 miles) and Wrexham (16 miles)and the nearest Doctor’s surgery is in Oswestry (½ mile). Please let us know if you require further information. We are able to provide information about local attractions, accessible activities, suggested pubs and restaurants and will be happy to help with bookings or obtaining access information if required. There are no public telephones but guests may use the landline phone from the house in an emergency. We do not offer a laundry service. We do not offer leisure or entertainment facilities. This access statement does not contain personal opinions as to our suitability for those with access needs, but aims to accurately describe the facilities and services that we offer to all our guests and visitors. The price per room per night includes accommodation and breakfast. Deposits are payable at the following rate: £25.00 per room booked for the first night’s stay £15.00 per room booked per night thereafter. By making your booking, our agreement is a legal contract and your deposit is non-refundable in the unfortunate event that you should need to cancel within 48 hours of your anticipated arrival and we are unable to re-sell the accommodation. If you cancel within 24 hours of arrival we reserve the right to charge you for the full cost of your stay. Your accommodation will be available to you from 4.00pm on the day of arrival, unless otherwise arranged. We may not be able to accommodate you if you arrive earlier than the agreed time as we will be busy preparing your rooms. Please ensure you contact us no later than 6.00pm to let us know if you will be arriving later than arranged. Failure to notify us may result in the room being re-let or the full cost of the room being charged to your credit card. Please be ready to leave the accommodation by 11.00am on the day of departure, unless otherwise arranged. We will provide you with an invoice, payable on departure for any additional services you may have used during your stay. The Proprietors reserve the right to refuse infants and children under 8 years of age. With the exception of assistance dogs, we do not allow pets at this property. Please note that in accordance with UK legislation, no smoking is permitted at Laurels; this extends to all rooms and parts of the house. Guests are respectfully requested to observe this condition and we reserve the right to ask anyone who disregards this policy to leave the premises immediately. Payment for the full booking will be charged plus the cost of cleaning all bedding, carpets, upholstery and soft furnishings plus the cost of an extra night so that the room can be fully aired before we can re-let. Please take care when staying in our home. You are responsible and liable for any breakages or damages, which you cause, to the accommodation or its contents. We do not normally charge for minor breakages, all we ask is that you report any incidents as they occur. Proprietors Kim & Howard have 30 years experience in retail, catering and hairdressing. They use the knowledge acquired to ensure you are made most welcome at Laurels, their family home for more than 20 years.